Interested in history? The next reader in the Authors Coffee House series will be Dr Ross Hebb who will read from his books about Maritimers in World War I, ‘In Their Own Words’! Reading is next week on Thursday March 21st at noon and a hot lunch will be served. Hope to see you there! Last Saturday, about thirty people gathered in the Rusagonis Covered Bridge Park to celebrate our beautiful covered bridge (the Patrick Owens Bridge) with readings and stories. Jeff Carr … Jeff is MLA for New Maryland-Sunbury and candidate for the Progressive Conservative Party in the upcoming provincial election. He recalled the loss this year of the Bell Covered Bridge and some of the frustrating circumstances around that loss. Linda Cogswell … Linda is a local historian and reminded us of the history of the Patrick Owens Bridge and the celebration a few years ago of its first hundred years! The original cost of the Patrick Owens Bridge in 1908 was $5,439 ! Rose Burke … Rose’s reading recalled the loss of the Upper Mills Bridge to fire in 1956 and what it was like to live in a border town in the 1950s. Kids would travel freely across the border, back and forth from Baring, Maine to Upper Mills, New Brunswick, to buy ice-cream or play at one-another’s houses! Jenica Atwin … Jenica, a long-time resident of Rusagonis and candidate for the NB Green Party in the upcoming provincial election, read a poem about the way covered bridges affect our daily lives. Roger Moore … Roger gave a poignant reading of his poems about our recent flooding in the area and recalled eerie battles with rising water and ruined belongings. Neil Sampson … Neil read a poem about the Bell Bridge by Fredericton’s Cultural Laureate, Ian LeTourneau. He also read his own humorous poem about attending a covered bridge gathering after a dental appointment (with ‘covered bridges’). and me (Jane Tims) … I read from my poetry book ‘in the shelter of the covered bridge’. The book includes several poems about the Patrick Owens Bridge and the wild life encountered there – deer and groundhogs, blue jays and rabbits. Ray Boucher, President of the New Brunswick Covered Bridge Conservation Association, was on hand to chat about the goal of protecting our remaining covered bridges and ask people to sign the petition to ask government to take steps to preserve the bridges. The park was perfect for the occasion and many folks said we should continue to use the park for community events. A big thanks to Jeff Carr and his team of Kim Smith, Pat and Mac Burns, Bernie Phillips and others who prepared some delicious food for everyone. The day was hot and breezy and all those hats were needed in the afternoon sun!!! On our drive to see New Ireland (Albert County), we took the Collier Mountain Road to the south at Teahan’s Corner to see the Forty Five River Covered Bridge. Exciting to see a covered bridge I had never seen before! Forty Five River is so-named because it took 45 minutes to raft logs from New Ireland down to Alma (Source: http://newirelandnb.ca/communities-the-irish-of-albert-co/ ). Where the covered bridge crosses Forty Mile River there is a steep gorge and the winds were howling when we visited the bridge. Although the road is rough traveling, the Forty Five River Bridge is in excellent shape, showing new timbers throughout. It was pleasant to sit on the bench-like side timbers and listen to the wind. 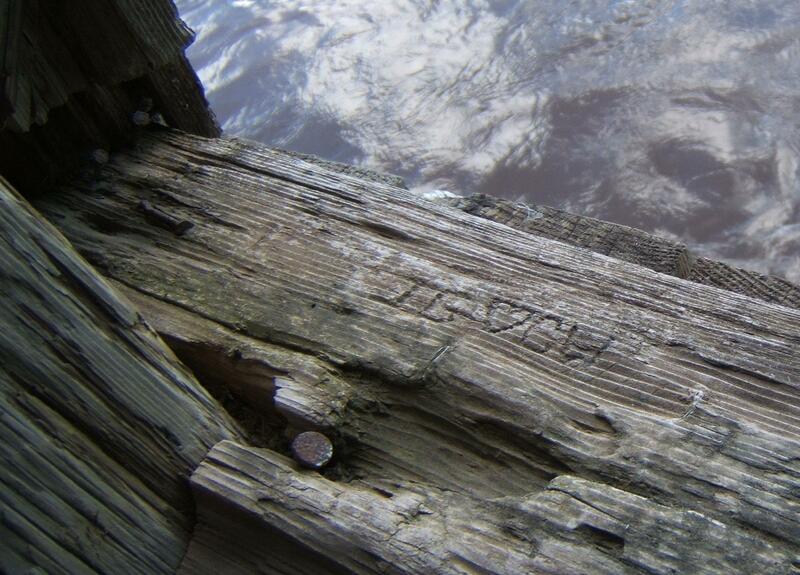 As with most bridges in New Brunswick, the bridge has a social history, partly engraved in its beams. 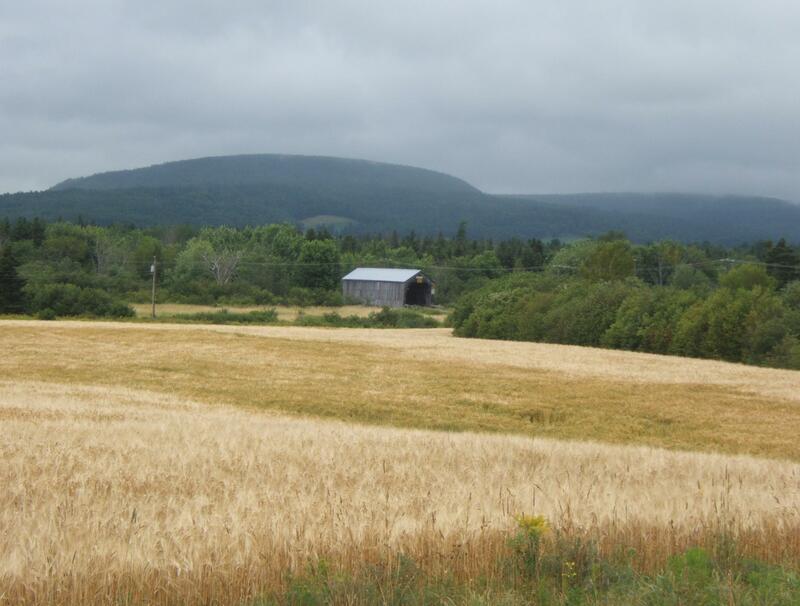 For more information on covered bridges in New Brunswick, click on the Categories tab at the right, under ‘covered bridges‘. Over the past weekend, we were inundated by heavy rains and a sudden rise in temperature. The resulting meltwater and rainwater combined to cause flooding in much of the province. There has been lots of damage to homes and roads and other infrastructure. One of the casualties is the Bell Covered Bridge, also known as South Oromocto River #3. Although its ultimate fate is unknown, the damage will be assessed and perhaps we will lose yet another of the 59 covered bridges remaining in the province. I am not alone in hoping this bridge can be repaired or preserved in some way as a reminder of our history and the importance of these bridges to our communities and our heritage. 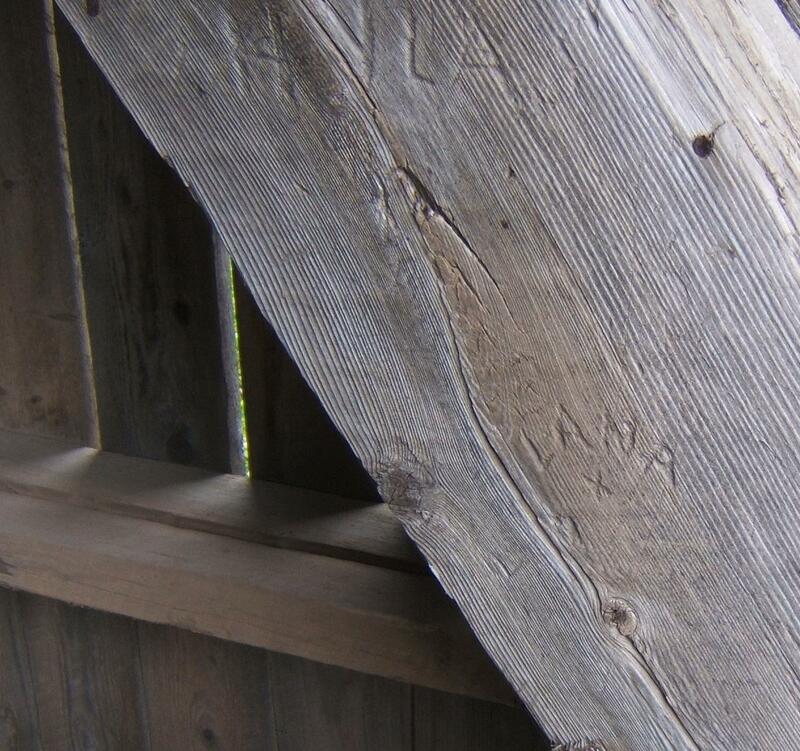 More sad news for New Brunswick’s covered bridge heritage … In the past months there has been lots of discussion about the fate of the French Village Bridge, also known as Hammond River #2, near Quispamsis, Kings County. Built in 1912, the French Village Bridge is one of only 60 covered bridges remaining in the province. In October, 2016, the bridge was severely damaged when a loaded excavator broke through the decking and undercarriage of the bridge. Although the government began repairs, rot was discovered in the sub-structure. After holding public meetings to consider options, the government recently announced the bridge would be demolished and a modular bridge would take its place. The covered bridge is endangered in New Brunswick. In 1900, there were about 400 covered bridges in the province. By 1944, there were only 320. In 1992, when we visited some of the bridges for Canada’s 125th birthday, there were 71. In 2017, as I write this, there are only 60 remaining. Loss of the French Village Bridge will bring the number to 59. Vandalism, flood, accident, fire and age claim more bridges every few years. The French Village Bridge is one of those included as subject matter for my upcoming poetry book in the shelter of the covered bridge. As a result, it is one of the bridges we visited to gather information on the plants and animals found there. 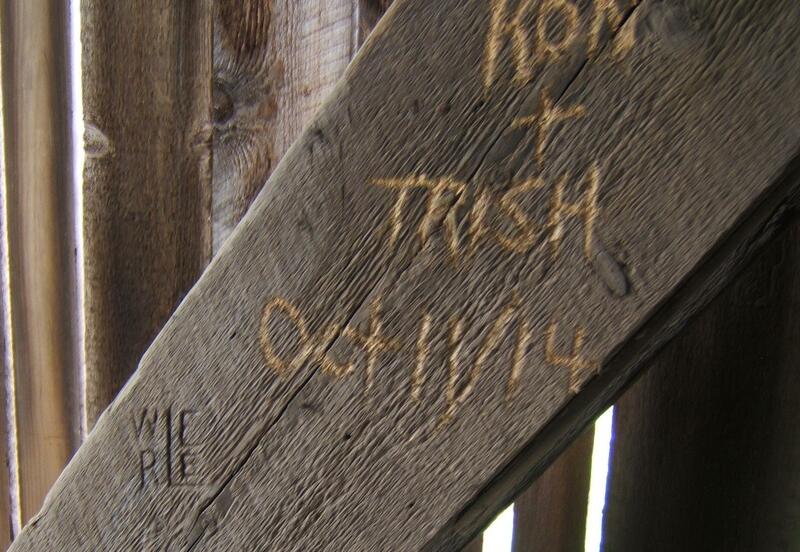 We are also interested in the human history of the bridge, so we took photos of the carvings inside. When I look at the small amount of information I have on this bridge, I am saddened and angered to know how much will be lost. Although economic considerations are important, the loss of built heritage includes loss of community character and part of our material culture. 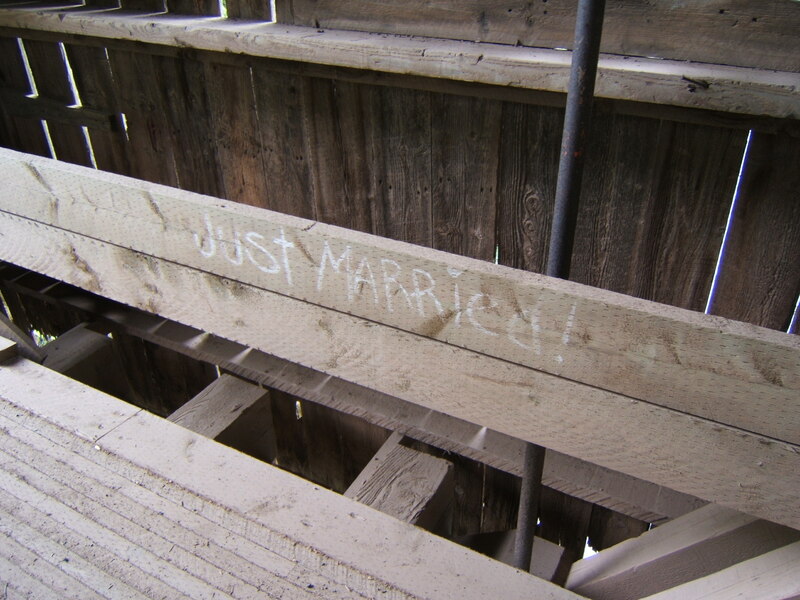 When ‘ROGER’ and ‘B’ and ‘E’ carved their names into the beams of the bridge, they probably thought the bridge would last many years into the future.